You’ve shipwrecked on a mysterious island with three others. You’re a soldier, the other surviving members a cook, explorer, and a carpenter. The good news is you think you can manage to get some food from the beach where you washed ashore. The bad news? You think you saw a cannibal tribe at the edges of the forest watching you. Well… crap. This is how the experience with Robinson Crusoe’s Cannibal Island scenario begins. One of six included scenarios that will truly test your ability to work as a team, manage your resources, and mitigate an onslaught of bad s--- that comes your way. 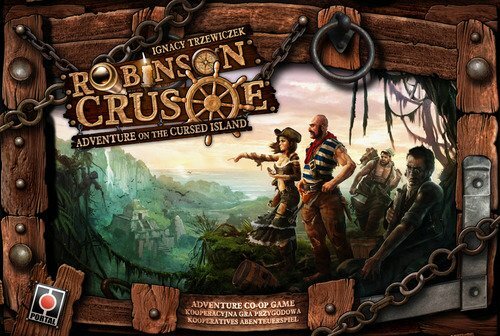 Robinson Crusoe is a worker placement game of survival on a desert island. Each turn you place your two workers on tasks. Do you want to explore more of the island? Go hunting? Gather food or wood? Attempt to build an invention, like a shovel or a knife? Or maybe put a roof over everyone’s head to avoid freezing that night? There are a lot of choices, and everyone only has two workers to contribute. You need food, you need protection from the weather and from roaming animals, and you need to work towards solving the scenarios goal before time runs out. Most tasks allow you to place one or two workers to complete it. It would seem crazy to dedicate two workers to anything, considering you have so few to spread around to so many necessary tasks. But, here’s why it helps. If you post two workers, then the task succeeds without any risk. So if two people gather wood, then you are getting that wood and nothing bad happens. When one person does a task, though, there is risk involved. You roll dice associated with that task (building, gathering, or exploring). The three dice determine if you are successful or not, if you take a wound, and if you have “an adventure.” Having an adventure means drawing a card from the corresponding deck. Most adventures are bad. Like, you get bit by a viper and are poisoned. So you can see that it’s not always advantageous to strike off on your own. What’s worth more – the extra potential tasks completed or ensuring a few crucial ones are done successfully? There’s no right choice here. But you will have to make that choice, with your fellow castaways, every turn. Get used to getting hurt. Wounds are common. You get them if you don’t have shelter to protect from the cold at night, from not having enough food, from attempting tasks alone, from fighting animals – pretty much all the time. Two things on your side are determination tokens, which are spent to activate one of the abilities unique to your character. And you can build inventions that can become very useful. But in all likelihood, you’re going to fail. Someone will die, or you’ll run out of turns before you’ve completed the scenario’s required tasks. Robinson Crusoe is brutal and beautifully designed and damn near impossible and I love it. It melds randomness with strategy, cruelty with hope in a way that feels perfectly in line with the theme. This is the board game equivalent to the tests faced when stranded on an island. Can you work together? Can you adapt to unexpected events? Can you keep the group’s morale up long enough to get off the island? The scenarios included in the box are all tough. They all use the board in the same way, too, so that the core game never really changes. But the scenarios are quite different. There’s the obvious “castaways” version where you must build a bonfire and alert a passing ship. But then there are the more unique ones. Like Cannibal Island, where you need to march to the cannibal camp and burn it to the ground to avoid being eaten. And then there’s the Cursed Island. You and your crew are missionaries, come to exorcise a haunted island. You may have shipwrecked, but you still need to go forward with your plan, setting up crossed around the island while dealing with a mysterious fog that hampers your effectiveness. Robinson Crusoe is a great game and certainly the best cooperative board game I’ve ever played. Tough choices make for tense moments. Complex, but easy to learn. Only six scenarios included in the box. A bad series of event cards early on can doom you before you have any hope of winning. 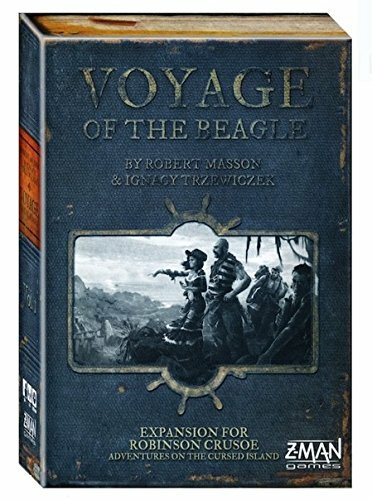 Only one expansion so far (featuring the adventures of… Charles Darwin?!). You want to own one of the best board games made in the past decade. You want to try something harder, more complex, and with more narrative than Pandemic.